June 21 in Othello, Wash. 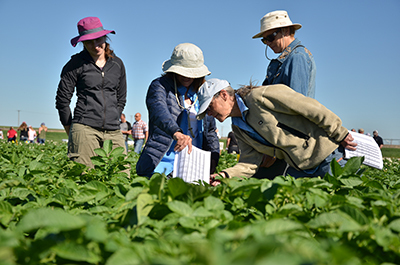 Potato experts at Washington State University will share the latest in disease defense, production advances and new varieties at the Potato Field Day, Thursday, June 21 near Othello. The free event will run 8:30 a.m.–1 p.m. at WSU’s Othello Research Unit, 1471 West Cox Road. Following a tour and discussions, lunch will be provided. Visitors will also meet André Wright, new dean of WSU’s College of Agricultural, Human and Natural Resource Sciences (CAHNRS). Washington state grows more potatoes per acre than any other state, and its $4.6 billion industry produces some of the best potatoes in the world. WSU and WSU Extension support the industry, developing new ideas, disease- and pest-fighting techniques, and sustainable potato varieties to meet consumer and industry needs. WSU hosts the Potato Field Day every year in partnership with the Washington State Potato Commission and Washington State Potato Foundation, giving growers, industry supporters, commission members and visitors from the Northwest and around the world an up-close look at potato research in action. Potato Field Day participants inspect plants for health and diseases. This year’s field day includes tours, discussions and a close look at detection for PVY, a devastating virus that can cause total crop losses. “Field days help everyone in the potato industry — from researchers to seed growers to processors — share ideas and see what’s happening in our research trials,” said Mark Pavek, WSU’s Pullman-based potato specialist. Wright will attend the field day and discuss the future of WSU agricultural research and partnerships. A world-renowned researcher in animal sciences, Wright is the former director of the School of Animal and Comparative Biomedical Sciences at the University of Arizona. For more than 20 years, he has researched ways to help animals use nutrients more efficiently, reduce methane, and increase food production, sustainably. Wright began his duties as CAHNRS dean June 1. Learn more at the WSU potato research website.